PEACE OF MIND - With Illumifun Smart Finder, you will always have a peace of mind knowing that you can keep track of your valuables and loved ones. Just make sure that the app is open all the time to enjoy continued connectivity. App uses Bluetooth Low Energy so it wont quickly drain your device\'s battery unlike other key finder in the market. WIDELY USE: Use your smartphone to make your finder ring when it\'s nearby but out of sight. Support for IOS iPhone 4S, iPhone 5/5S, iPhone 5C, iPhone 6, iPad 3, iPad 4, iPad Mini and above. The tracking distance is 0-25 meters. FEATURES: Our lost and found tracker can find all of your family\'s prized possessions, anywhere, and at anytime. Use this GPS tracking device to locate any item, using the Last-seen Tracking system. Each one features an anti lost alarm and a double press button, which will actually alert you to your item\'s location. You\'ll always know where to look because this device finder can find anything; including items with flat surfaces. GIVE YOURSELF MORE TIME: The Smart Finder finds your valuables with our easy-to-use \"Small Lovely\" app for iPhone and Android. Simply use the key ring to attach the smart finder to your keys or just stick the smart finder to any item of choice with the adhesive tape. 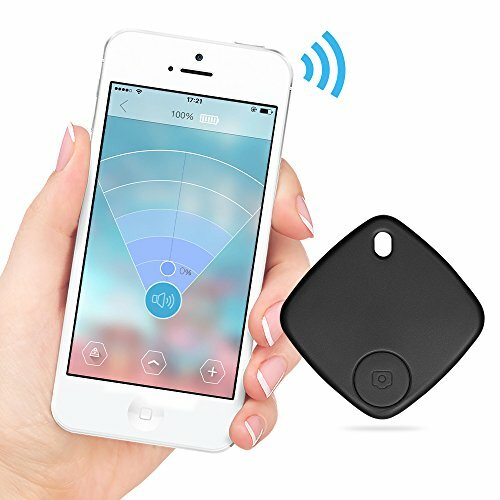 You can ring your smart finder and use the indicator radar to find your items or you can ring your phone if you lose your phone even on silent by tapping the smart tag. BATTERY LIFE: Just replace battery yourself once a year. Extra battery included.